Updated: 1/2014 Since the 2010 games in Vancouver have concluded, I have deleted the Vancouver2010 webquestions but have kept webquestions about the games in general and the country of Canada. 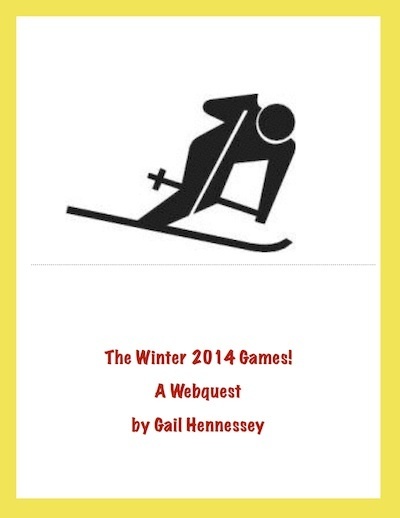 2/9/2010:My Vancouver Winter Games' Webquest was selected by the Vancouver Olympic 2010 Educational Project Showcase to be highlighted at the official website for the Winter Olympics! If you watch the Vancouver Winter Olympics, specifically the ski jumping competition, at Whistler, B.C, you might notice something missing...women. Did you know that women aren't allowed to participate in ski jumping at the Olympics? Since 1998, the IOC(International Olympics Committee) has been asked to change the ban on women ski jumpers, but it has yet to do so. A ruling in 1991 by the IOC said that all future Olympic sports MUST be open to both men and women BUT it only applies to future sports not those that already exist! The only other olympic competition that is men's only is the Nordic (but that includes ski jumping!) Women indeed are good at ski jumping. In fact, world ski jumping champion, American Lindsey Van, holds the North American distance record with a jump of 171 meters (563 feet) for both men and women, done at Whistler. Maybe,the 2014's winter olympics in Socchi, Krasnodar Krai, Russia, will be different with women able to show their ski jumping talents! What is YOUR opinion on this?